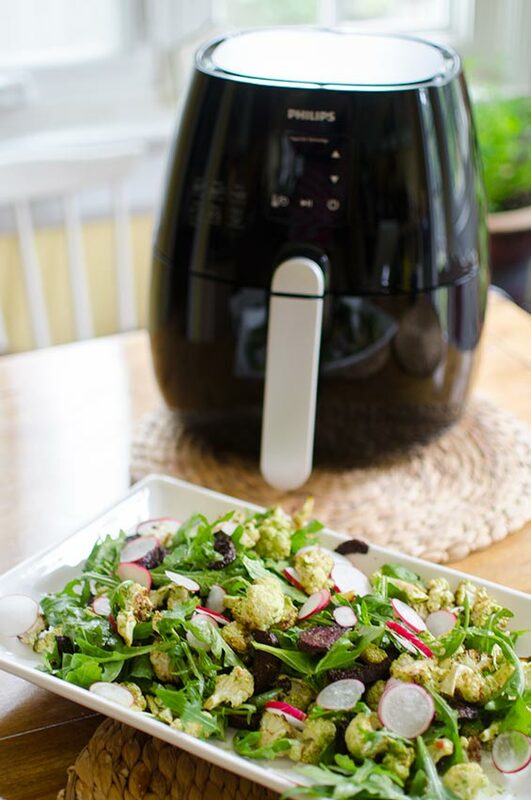 How to make air-fried cauliflower and beets using the Philips Airfryer for a delicious, fall salad with arugula and radishes. I always think of eating salads in the summer, when you can just toss raw veggies together and call it a day, but I do love a fall salad filled with warm vegetables. The truth is, as delicious as they are, fall and winter salads are definitely more involved and I don’t always want to turn on the oven to roast veggies for a quick salad. It just seems like a lot of work, waiting for the oven to warm up and cleaning the baking sheet, especially when you’re just making a salad for one person. Are you with me on this? 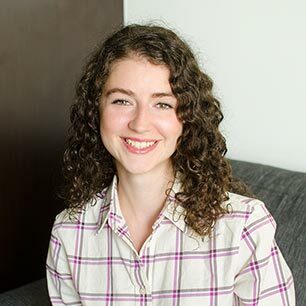 And this becomes even more of a process after a long day of work, and let’s be honest, most of us, young, city dwelling folks are working long hours and cooking for one person. That’s where I’ve discovered what I think might be the perfect tool for young professionals, the Philips Airfryer. I’m talking about healthy, homemade meals in minutes, you guys. I feel like we never have enough time these days, everyone is rushing from one thing to the next, and the first thing to go? Cooking homemade meals. Takeout is just too easy, especially with all the new delivery apps and technology, you can just press a button and food will be at your place within minutes. The Philips Airfryer can fry, bake, roast and even grill with little to no oil, but for me, the best part is how quickly the Rapid Air Technology cooks your food. 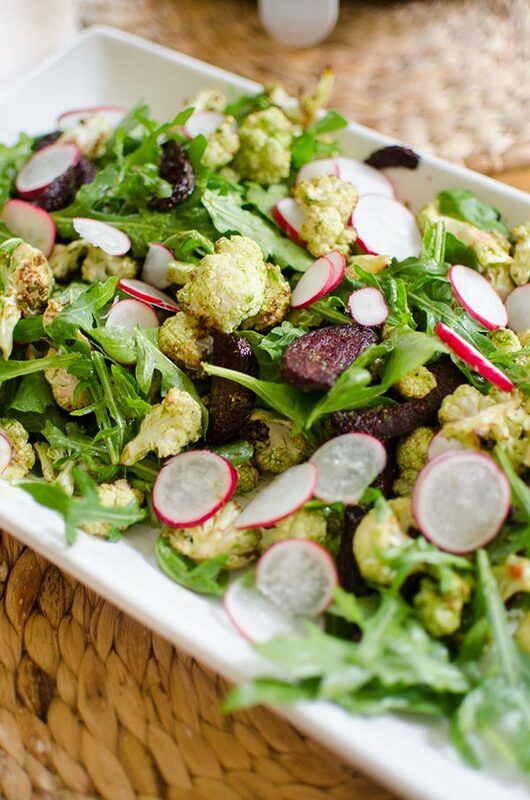 Using Gordon Ramsay’s cooking tips (he has partnered with Philips and this salad pictured is one of his recipes), in just eight minutes you’ll have perfectly crisp air-fried cauliflower and just 12 minutes for crisp and sweet air-fried beets. And the machine heats up so quickly, by the time you’re finished prepping your veggies, it’s ready to go. To cook cauliflower in the Airfryer it starts with four ingredients; cauliflower, olive oil, salt and pepper. The key is to arrange the cauliflower florets in a single layer so the air can circulate and the veggies cook evenly. In just eight minutes you’ll have perfectly crispy cauliflower–all you have to do is give the florets a stir halfway through. 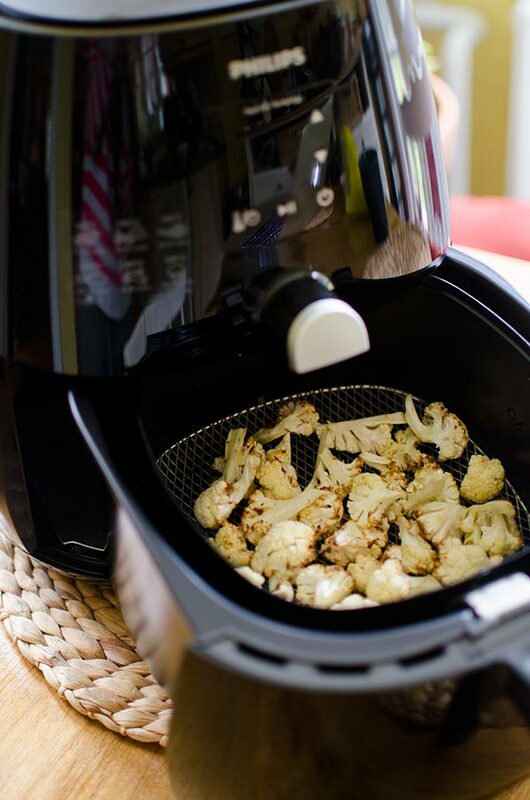 Make crispy and delicious cauliflower in the Airfryer in just 8 minutes. Preheat a Philips Airfryer to 360°F (182°C). Toss cauliflower with olive oil and salt. Arrange the cauliflower in a single layer in the fry basket and insert into the air fryer. Cook for 8 minutes, stirring the cauliflower once halfway through the cooking time. Repeat with any remaining cauliflower. 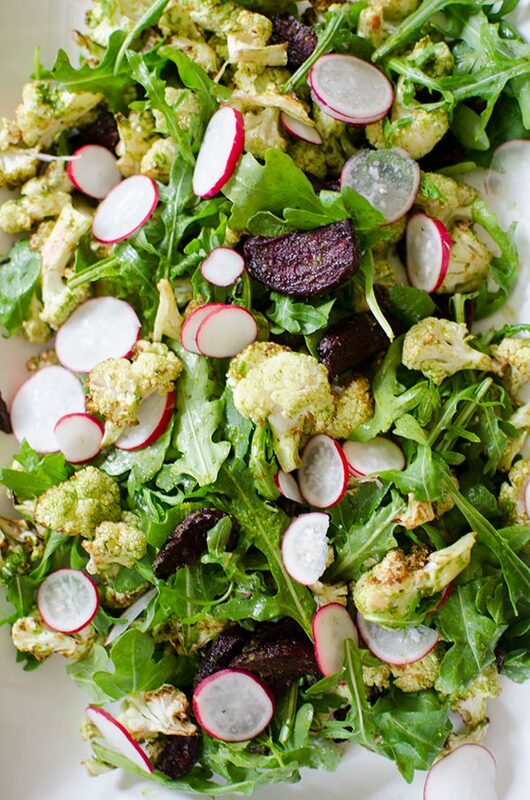 I like to cook cauliflower and beets just to snack on or serve alongside a roast chicken but you can also throw them in a salad with your favourite dressing (I’m partial to a classic balsamic vinaigrette or an apple cider vinaigrette for a fall salad). To cook beets in the Airfryer it starts the same way as cauliflower, tossing with olive oil, salt and pepper. The beets take longer to cook in the Airfryer (12-14 minutes), which is to be expected as the cooking time for beets in general is longer than cauliflower. The beets need to be arranged in one layer and are flipped halfway through. So simple and delicious! In just 14 minutes in the Airfryer you'll have perfectly cooked crispy beets to add to salads all winter long. Arrange the beets in a single layer in the fry basket and insert into the air fryer. Cook, turning once halfway through the cooking time, until fork-tender, 12 to 14 minutes. Disclosure: This post was sponsored by Philips – as always, all opinions are my own. Thank you for supporting my sponsors and allowing me to continue creating recipes like these air-fried cauliflower and beets. Interesting recipe for cauliflower, if it`s not good prepared - I don`t like the taste of it! Would want to try your way of making it! Thanks Kelly, I hope you enjoyed!